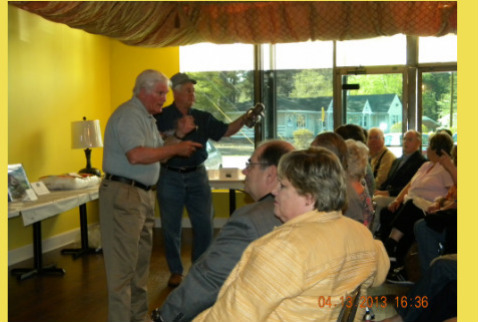 The Rocky Mount Railroad Museum celebrated its first Annual Banquet and Auction on April 13, 2013. The celebration was held at The Hunter Hill Café in Rocky Mount. All of the auction items were donated by local merchants and train enthusiasts. The auction attendees were shown an array of train and miscellaneous items. They also were entertained by our very talented and humorous auctioneer, John Tugwell. Doug Riddell, a retired locomotive engineer and author of From The Cab: Stories From a Locomotive Engineer presented a historical slideshow and a stimulating account of his railroad experiences. The buffet dinner prepared by The Hunter Hill Café staff was enjoyed by everyone.